Welcome to the city of Atlanta, home of the 1996 Olympic Games, international icon, jewel of the south, and yet still the bearer of laid back country charm and southern hospitality. Atlanta is arguably the most relevant city of the southeast, with several major league sports teams, some of the finest dining in the world, a vibrant theatre and arts community, numerous museums, the largest aquarium in North America, and a city of endless opportunity. It is primarily a 3 season city, inviting you to enjoy the outdoors with weekly outdoor concerts scattered throughout the city. Atlanta is one of the largest business and transportation cities in the country with many large and small companies calling Atlanta home: Coca Cola, Georgia Pacific, Southern Company, Delta, AT&T among them. Only New York and Houston have more Fortune 500 companies within its city limits. Unlike other major cities of the southeast, Atlanta eschewed its historic Old South architecture and established itself as the leading city of a progressive "New South". History likely had a role in this, since, as a major hub of transportation during the Civil War, the city was burned to the ground at the order of General William Sherman as the Union Army advanced to the sea during the War Between the States. 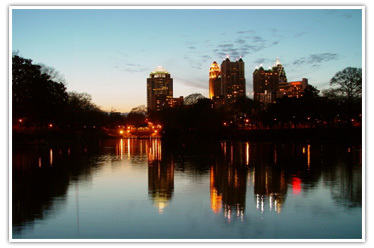 Atlanta later became a focal point during the civil rights movement. It is here where Dr. Marin Luther King Jr. preached at Ebenezer Baptist Church. Atlanta is also a complex city, with high end shopping in Buckhead, and trendy nightclubs and restaurants tucked into all parts of the city- Little Five Points, Grant Park, West end, Underground, and others each have a unique flavor and charm. The house styles are as unique as each of these neighborhoods displaying their creativity in bungalows, Georgian, Greek Revival, and Craftsman style Cottages among many. The Deep South and the Bible belt are linked monikers, and Atlanta is no exception with over 1000 places of worship. Most are Christian- protestant but there are a significant number of growing catholic churches in the area, several mosques, synagogues, and the largest Hindu temple outside of India. But even within this diversity, you see the common trademark of the south- friendliness. Down here, people still smile and wave- just because they want to. People open doors, and say hey ya'll, and still do nice things for others. Coca cola is the drink of the day, sunshine is on tap, and hospitality is on the house. It is a great place to visit, but an even better place to call home. For those wishing to take full advantage of all that Atlanta has to offer year round, Southland Custom Homes is a Atlanta Builder that specializes in custom home building for the Atlanta area. Southland Custom Homes is an on-your-lot custom home builder, meaning that they build the home of your dreams in the location of your choice! Southland Custom Homes, a custom builder in Atlanta, GA has model showrooms located in Marietta(265 N. Cobb PKWY, Marietta, GA 30062), Dawsonville(98 Bethel Drive., Dawsonville, GA 3053), and Macon(3956 Bloomfield Village Drive, Macon, GA 31206). Stop by or call us today at 1-866-56-BUILD* to see all that Southland has to offer!